Lots of purple corn, plus fruit rinds and spices. Once everything is in the pot, just cover it all with water. 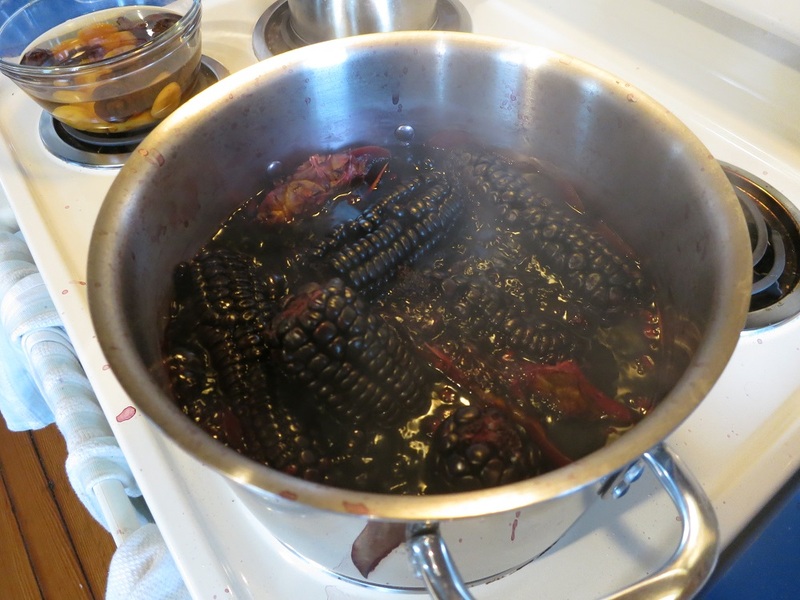 Mazamorra morada is purple because the primary ingredient is purple corn. The process by which mazamorra is made is actually relatively simple. 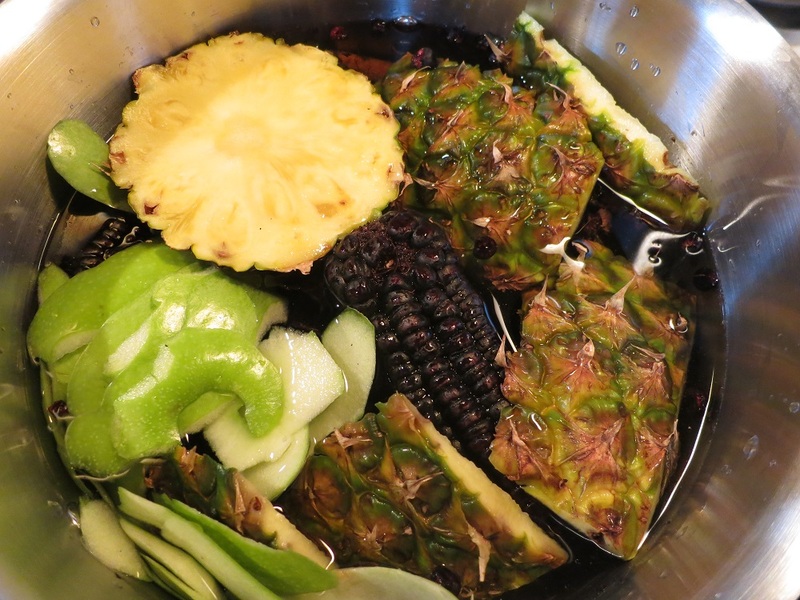 You fill a big pot with lots of purple corn, a bunch of fruit rinds and spices, cover it with water, and boil it for a while. 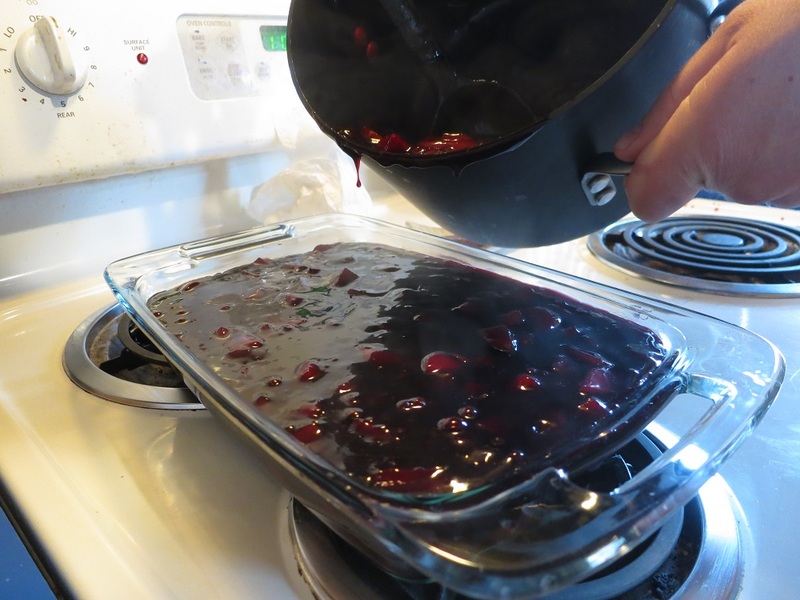 Then you strain it a bunch of times, add more fruit, a ton of cornstarch, and eventually when it’s nice and thick, you let it cool. Easy right? Everything turns REALLY PURPLE not too long after the boiling starts. So, you can imagine that the pressure was on when Tania proclaimed that she wanted to make mazamorra morada here at home. I am in no way Peruvian. Up until this past year, I had had no experience cooking Peruvian food. And so, not only was I being asked to cook what is probably Tania’s favorite Peruvian food, the baseline against which it would be compared was going to be the best version of that favorite food in all of Peru. Oh. And she was going to serve it as a dinner party. First things first, I had to get purple corn. Now purple corn isn’t something you can walk into and buy at your average grocery store. Not even at Whole Foods. I ended up obtaining my via the internet, from a place called Amigo Foods. Other places I’ve seen it locally though are: Saraga International Grocery, Los Galapagos, and Jungle Jim’s in Cincinnati. Corn in hand, the rest of the process was easy. Or relatively so. The recipe I had comes from the Art of Peruvian Cuisine, a book I’ve written about before. 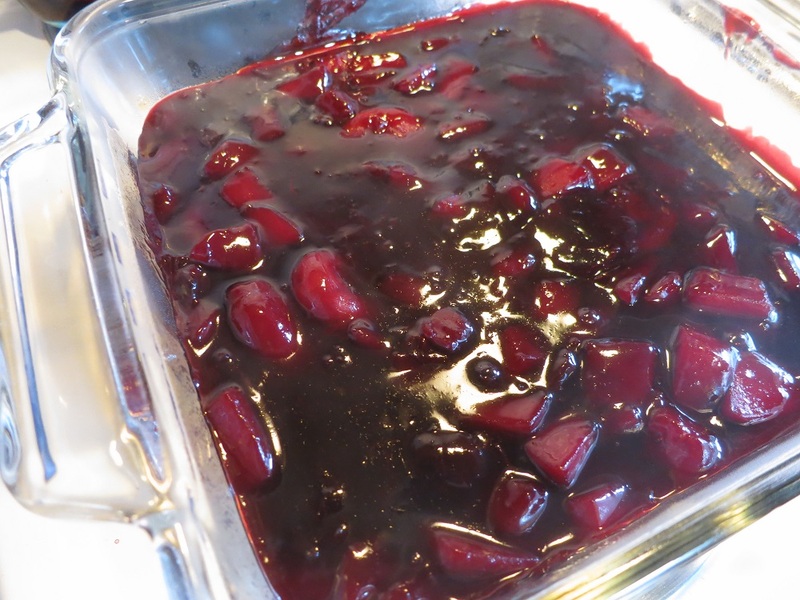 Unfortunately, that recipe called for a bunch of other fruits that I didn’t have on hand. Tania declared however that she didn’t care which fruit was in the mazamorra, just as long as it had lots and lots and lots of it. So here’s the recipe. If I made a fruit substitution, I’ve included in bold which fruits I actually used. No bold means I just used what’s called for. Letting the dried fruit soak. I ended up doubling the dried fruit and using less fresh. It worked, but I’d probably stick closer to the recipe next time. 1. 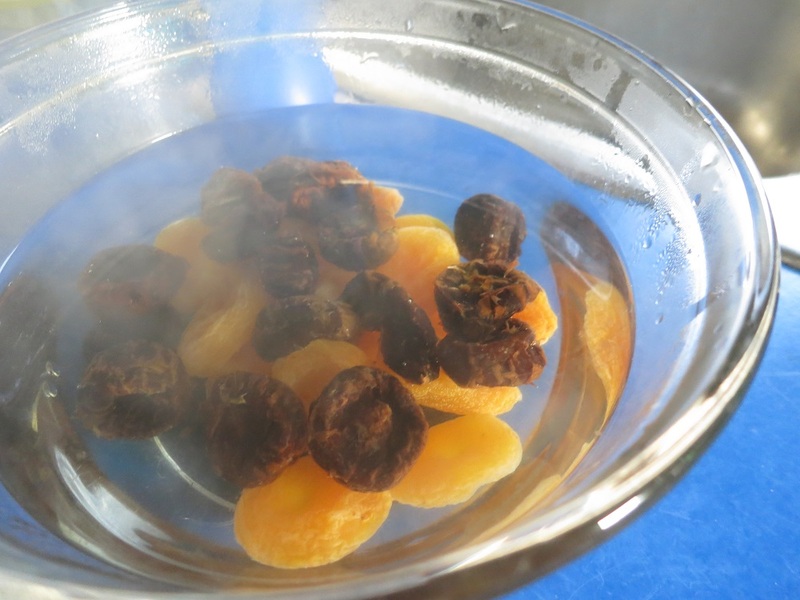 Soak the dried fruit overnight. (I soaked in boiling water for about an hour instead.) Peel the quince, pineapple, and apple. 4. Remove the corn and strain liquid again through a fine mesh sieve or muslin-lined strainer. 5. Dice the pineapple, apples, and quinces. 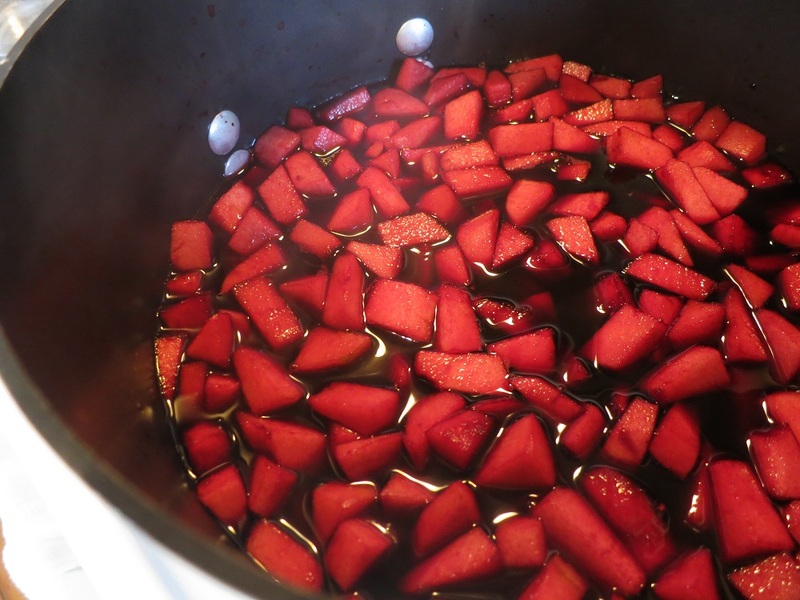 Add the soaked dry fruit to the purple corn liquid and then add sugar and the diced fresh fruit. Bring the mixture back to a boil. 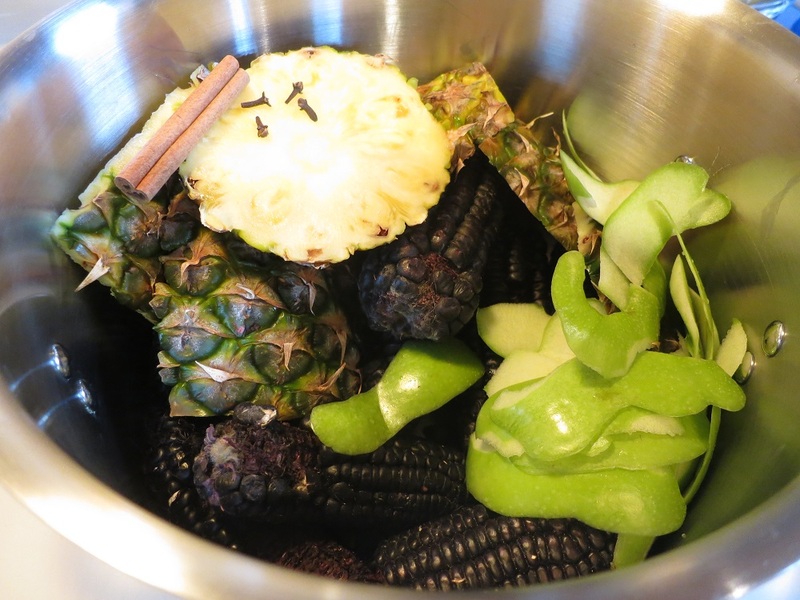 Fruit added, just returning to a boil. 7. Stir in the lime juice and remove from heat. Pour into an 8×11 serving dish (I think a 9×13 would work better) or individual cups and let cool. Serve dusted with cinnamon. I definitely needed a bigger dish — in the end, I ended up using two. This dessert looks amazing, but I have to quarrel with your implicit assertion that desserts are the only vegetarian food worth cooking! Try harder!